Three years ago, Life is Strange, to put it in cliche but metaphorical terms, took the gaming world by storm, revisiting the concept of “the butterfly effect” and combining it with strong character writing and an innovative choice-driven narrative delivery system to deliver a breath of fresh air in digital format. This week marks the launch of the official sequel, Life is Strange 2, raising the question if Square Enix and Dontnod Entertainment can strike lightning twice and live up to their own legacy. 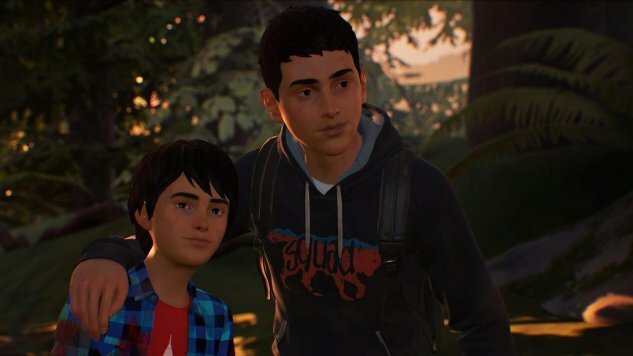 Life is Strange 2 introduces us to brothers Sean and Daniel Diaz, two young boys living in West Seattle with their father Esteban. Following a confrontation with a neighbor, Esteban is shot and killed by a police officer, forcing Sean and Daniel to flee south through the Washington state mountains and fend for themselves. Along the way they encounter the threat of hostile wildlife and the equal threat of racist locals, while bonding as brothers and coming to terms with their father’s death—as well as what may be Daniel’s growing supernatural powers. There’s a lot I like about Life is Strange that returns in Life is Strange 2, particularly the setting and character writing. The attention to detail is marvelous; it is impressive how well Dontnod have been able to recreate the feeling of key Pacific Northwest areas and scenery. One of the most notable things about the original game, outside of its beauty and its interesting rewind mechanic, was its lead characters, Max and Chloe. While I’m sad to see that Life is Strange 2 doesn’t have strong female leads, the story of Sean and Daniel feels equally compelling and important. The first chapter does a great job of establishing the momentum of the game’s narrative arc. The Diaz boys are very easy to root for, and the pain Sean feels as he must protect his younger brother from the truth of their father’s absence is palpable. The more you participate in the bonding experience of being an older brother, the closer the events seem to hit home. By the end of the chapter, I felt genuine fear for the boys and, while I usually don’t waste time speculating on how a piece of fiction will end, I found myself hoping for the best. Sadly, the game does seem suffer a bit for not having a narrative novelty of its own. While I understand why Max’s rewind powers were not reused for the sequel, the split-screen choice sequences from critical moments in Sean’s story don’t have nearly the same impact. I remember the prequel Before the Storm similarly stumbled a bit for not having its own gimmick to fill the void, and while Chloe’s ability to “Backtalk” felt forced compared to Max’s power to dial back time, the effort was at least there. I don’t know that the dialogue and multiple player choices and story paths carry the same weight, as a result. I’m curious to see how certain decisions will play out, but making those decisions wasn’t saddled with nearly as much trepidation and grief as before. And some of that tension is also disrupted by the numerous observational moments where the player can listen to Sean’s thoughts while interacting with objects. While key to the series’s identity, it also bogs down the pacing. That being said, Life is Strange 2 boldly covers subject matter that so often is tiptoed around or completely ignored in entertainment, and it’s refreshing to see the studio address topics like racism and police brutality head-on. While I’d like to see some technical aspects polished up (the facial animations still lack a decent range of expression, for example), Episode 1 is a solid start on this new saga in the series. I look forward to seeing what becomes of the Diaz brothers as they continue to head towards Mexico over the course of the next four episodes. Life is Strange 2 Episode 1 was developed by Dontnod and published by Square Enix. Our review is based on the PlayStation 4 version. It is also available for Xbox One and PC.